Vankeis-matic is a comparison tool that shows the same photo, taken with all possible lens/film combo, on a single page (a.k.a. the hipsta-matrix !). It can display the photos in various resolutions (from 48 up to 576px), and allows you to filter the gear you wanna see. This way, you just have to scroll through and compare the different renderings. 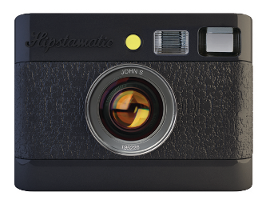 There are other websites providing useful information about the various Hipstamatic stuff, like hipstamatrix.com, but I found none allowing real side-byside, customizable comparisons. Well, pretty easy : you just have to take the 625 photos (all film/lens combinations at the time writing) of the same scene, with the same lighting ! I've shot indoors, with artificial lighting. The scene is just a composition of various objects I've got at home. Then, it was a day or two hacking a few lines in order to make it happen. I don't plan to improve the software a lot, but clearly having a single scene ain't enough. It would be damn cool to have matrixes for different kinds of photos (portraits, landscapes, various lighting conditions etc.). So if you wanna contribute, you can actually take all those pictures (can be faster dividing the work between friends) and contact me, I'll surely integrate them. All the code is reusable : creating a matrix from the pics is almost no work. Would be my pleasure to run those routines on your photos !